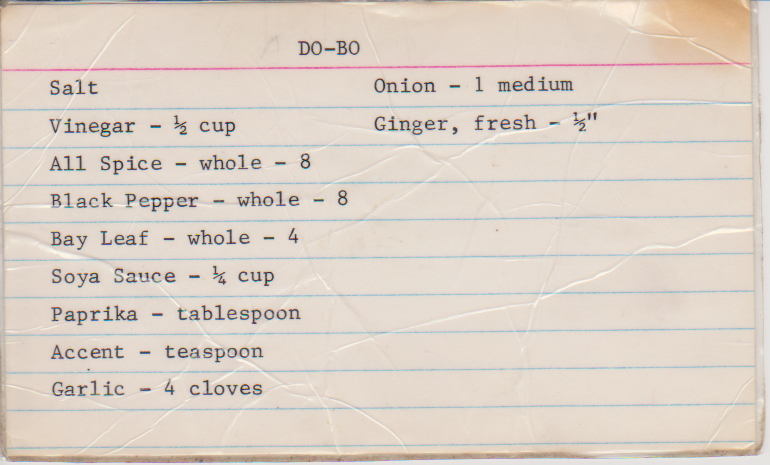 Recipe card for adobo (spelled "Do-Bo" on the card), a popular Filipino dish. The recipe, typed and laminated, belonged to Ronald Gonzales. 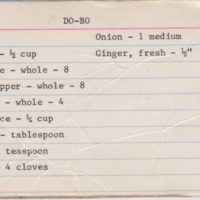 Ronald Gonzales, “Adobo, or "Do-Bo," Recipe,” FilipinoLa, accessed April 26, 2019, http://filipinola.com/resources/archives/items/show/21. This Item dcterms:creator Item: Pinocino, or paksiw, recipe card.